Cavy Performance is a high-fiber, alfalfa-based diet fortified with nutrients essential for growing, pregnant and nursing guinea pigs. Growing guinea pigs require more protein, calcium and energy. Cavy Performance provides an optimized balanced protein source, containing the amino acids required for the growth and health of your guinea pig. Alfalfa hay, a natural forage, provides the fiber necessary to maintain your guinea pig's intestinal health, making Cavy Performance the veterinarians number one choice for your growing, pregnant or nursing guinea pig. 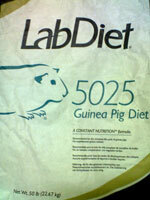 Guinea pigs require daily supplementation with Vitamin C. Cavy Performance includes Stay C-35, a stabilized form of Vitamin C with a 12 month shelf life. Guinea pigs are designed to eat and digest fiber found in plant material. Timothy hay provides the fiber necessary to maintain intestinal health, and makes Cavy Cuisine the veterinarians number one choice for your adult guinea pig. Pellets made with timothy grass meal provide a lower level of protein, calories, and calcium than traditional alfalfa pellets. 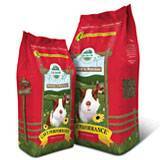 Cavy Cuisines optimal calcium to phosphorus ratio also helps maintain a healthy urinary system. Pellets also provide balanced nutrition in every bite and prevent selective feeding behaviors. 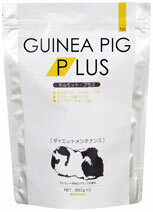 Guinea pigs require daily supplementation with Vitamin C. Cavy Cuisine contains, a stabilized form of vitamin C that has a 12 month shelf life. Cavie nature is a complete diet, carefully composed with selected natural ingredients and enriched with freshly harvested alfalfa and herbs. Alfalfa is rich in proteins and fibres, that guarantees an improved intestinal activity, a better digestion and an optimal condition. Lightly flaked, dried extruded vegetables and herbs are a real delicacy for yor guinea pig as it encourages an optimal ingestion of food. 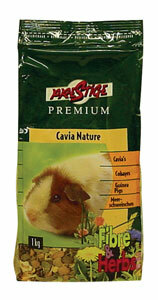 Cavie Nature is composed with 16 different ingredients, contains all necessary amino-acids, minerals and trace elements, and are adapted to the specific feeding needs of guinea pigs. Blended together and extrusion cooked so there is no waste, the level of Vitamin C is as much as three times higher than in most other feeds, which, when combined with the other vitamins in the feed, A and E, promotes optimum health and vitality. Supplemented with minerals and vitamins, it also includes the correct calcium to phosphorous ratio and the high level of sulphur amino acids maintains and improves coat quality. Supa Guinea Excel® also contains Profeed® to aid hind gut fermentation and nutrient digestion. High in fiber, good quality timothy pasture mix which holds down obesity with its low calories, makes digestion function active, prevents the illegitimate occlusion and the like which happens from connection abnormality of the tooth. Diuresis promotion, for healthy stomach, rich in dandelion plantain of the wild grass which is the effect in the liver and appetite increase etc. is combined, digestion and absorption is enhanced.